So, Oakley finally had his leg and part of his pelvis removed on Friday. He is still at the vets as he is struggling to gain his balance on his remaining legs. I spoke to the vet today and he has a lymphedema in his remaining hind leg which is hindering his ability to weight bear on it. They think they will need to keep him in for at least another week. Is swelling in other limbs common following surgery? I wonder if anyone else has experienced this? I am afraid I have no advice. A lot of times there’s swelling due to the stress to the remaining limbs but I probably wouldn’t expect this immediately after surgery. I can imagine that there would be an edema after surgery due to fluid built-up though. I’m sure Oakley is in good hands and while I can imagine how much you miss him, try telling yourself he’s getting the best possible care. My dog had to stay an extra 3 days because of issues with his drain and it was really stressful for me, too. What I have learned during that time is to make a list of all the questions that were working their way through my mind and to ask them all at the vet clinic or even over the phone regardless of what the vets would be thinking of me. -It does feel better to really have a good understanding of what’s going on. Try and get some rest while you can, you may be looking at some sleepless nights once you get Oakley back. Oakley had MAJOR surgery involving not only a leg amputation, but removal.of pelvis AND he had an I fection to boot! I’m not a Vet, but the infection itself could cause some lymphedema, as well as the “trauma”‘of the surgery. So ues, we have seen swelling as you described after surgery. How are the Vets moving forward with this? I’m sure he’s already on a strong dose of antibiotics, but I would want them to confirm they are being effective. Are they using any pressure bandaging or heat massages? Eating, pooping, drinking, peeing?? Normal temperature? Do they have his pain managed? Complete vloodwork all normal? As Tina suggested, make a list of your questions and get them answered! Speak DIRECTLY to the Surgeon/Vet. Even without the edema, mobility would take longer than most surgeries because of the pelvis removal. Please update when you can. TRY not to worry. Oakley’s been through a lot and recovery takes time. He’ll get there! Thanks guy for replying, it can be quite lonely dealing with this sometimes! I was thinking about visiting him at the weekend but I don’t want to stress him out. I will speak with the vet and see what he says. I never thought to ask about his ‘movements’ but he is eating more now they have dropped his dose of pain relief. They were going to move him to another unit to have one on one physio and swimming to see if it helps reduce the swelling. I will get a list of questions together for the vet and speak with him later. Sorry to hear he’s still in there. If my memory serves me right, yes, we’ve seen this type of swelling before but it’s not common. I searched but found a lot of posts with “swelling remaining leg” in them so it’s a lot to dig through. Maybe if you have insomnia it will come in handy! Keep in mind that when a limb is removed, all that fluid that was going through it has to go somewhere in the body. Typically it re-absorbs into the rest of the body but sometimes it doesn’t. I’m betting that’s the case with your guy. Glad to hear they’re moving him into a place where he can have good rehab therapy to help move the fluid around into his body. The question of whether or not to visit is tough. It all depends on the dog and the situation. Many vets have told us that when the parent visits and leaves, it causes more stress on the animal than if they had never been there at all. Usually the visits are more for the person’s peace of mind than the animal. Vets don’t typically ask parents to come in unless they’re trying to get the dog to eat or something. If your gut instinct is telling you not to visit, than I would go with that, you can’t go wrong on instinct. Ask your vet lots of questions and write everything down so you don’t forget. It’s easy to get overwhelmed. Keep us posted OK? I’m sorry that Oakley is having these issues and I’m sure you must be missing him terribly. Just my two pennies worth on the visiting question. I do agree that it depends on the dog and the situation. My Meg spent a huge amount of time in hospital, more than two months in total, with the longest stretch being about four weeks. I didn’t visit her at all because I thought it would stress her to be left again, and reinforce the separation. When she was there, my feeling was that she was in the world of there, like a sort of bubble, and I felt that if I visited that would puncture it. There was a lovely woman on reception who used to go through and send me photos and updates of her daily (in addition to the medical updates I got from the vets and nursing staff). You can never be sure what is best, of course, and I don’t know how she would have been if I had visited, but my instinct is still that this was right for us. The first few days of each hospitalisation were always the most difficult for Meg, as she learned to trust the people caring for her. After that, she settled into it. Perhaps, if you decide not to visit, you could ask one of the nurses to send you a pic of Oakley. It’s kind of bitter/sweet to get them, but overall I found it helped. Big hug, and here’s hoping that swelling goes down soon. Hi guys, Oak is still in the vet. His surgery site is now red and needs ice packs applied daily. They haven’t said whether it is infected but it doesn’t sound great. I know its still early days. I decided not to visit but will ask if they can send me some piccies. He is eating and drinking well and I heard him barking in the background, so there is nothing wrong with his lungs! I think sometimes you feel that the vets have got you ‘to ransom’ sometimes as you are totally in their hands. It can definitely feel like that with vets. They are the ones with the education in that field after all and you are so reliant upon what they tell you! But really, if you feel like there’s things you don’t but would like to know or wonder about: ask ask ask. Disregard ANY feelings of “this will sound dumb”!! That was a process for me but I am at a point today where I know no shame 🙂 I, personally, like to be 100% informed, so if you feel like you want to know if Oakley has an infection: ask. Anything else: ask. if you feel like you’ll forget about half of your questions by the time you get to speak to them: write them down. Keep us posted, you’re not alone in this!! I agree with Tina. Eating and drinking is certainly good news but I know how worrying this is and how badly you want him home. Do you have a good relationship with your primary care vet? It can sometimes be helpful if they can advocate for you. I had a terrible experience with one hospital and having my own vet take charge of the situation (and ultimately transfer her care elsewhere) was a tremendous relief. Not suggesting that this is what Oakley needs, but it does sound as though you could do with more information. Why do they think it’s red etc? Communication is important. I know that feeling of being held to ransom extremely well. But you are NOT alone. You have the power of the Tripawds Nation behind you. You do have options and we are all here to support you. But we DO have a huge YAAAAAAAAAY FOR BARKING AND EATING AND DRINKING!!! Okay, probably going against the grain here, and this is just me. At this poi t and under these circumstances, I DO think you need to visit Oakley!!! I also would want (demand) a face to face with the Vet (not a Tech) and have every single question answered!! And have them answered two and three times until you fully understand what’s going on AND what’s being done!! Have they done a culture to check for MRSA or any other infection?? Curious about them wanting to start swimming this soon. Would want to know how they are keepr incision dry and protected! I may have misundsrstood. As far as physio this early on a dog who just had his leg AND pelvis removed, I would ask SPECIFICALLY what that entails! I am NOT a professional and they are, but I would hope it is very, very minimal at this point. I did have a few choice words with the nurse this morning! She told me that Oak’s remaining leg was sore as he had been weeing in his ‘kennel’. I wanted to know why he was weeing inside as he hasn’t done this until now. I am not one to make assumptions but perhaps different staff interpret his ‘wanting to go for a wee’ whining with pain perhaps.. Either way, they have now completely shaved his leg so that they can apply cream to his sores where he has had urine on his leg. I am not too impressed! I asked when I could collect him and was told it would be another few days. The surgery site hasn’t completely healed and there is some discharge from the end of the wound although the sutures are all ok. So, I am really none the wiser and forgive me if I am starting to sound angry but I am worried about him! So hes, again just me, but I woukd definitely go for a visit today if you can! At the very @east they’ll do things extra good if they know yiu are coming! And send us some oictures, okay? If there is some “discharge” and the sutures look okay and it’s not an jnfection, there is no reason he can’t come home! 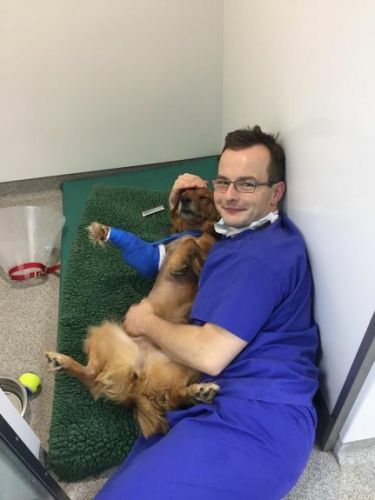 Oakley does not need sores in his remaining leg! That should not have happened! We’ll watch for an update. Hopefully you can go ahead and pick him up or, at the very, very least, go see him!!! Unless there is some compelling reason to keep him (a d maybe there is), I would delay any of their wanting to put him in their rehab unit for now and just get him home! And just a PS…..I wluld find out what pain meds he is in and how often. Please remember that you are not hostage to your vet. You pay their salary. You have the power to take Oakley back to his regular vet if you desire, or to another specialty center. I know that’s probably not what you want to do at this point but it’s something to consider if this goes on much longer. It does sound like they are being attentive to the issues at hand, but bedsores are something that we don’t see a lot of here unless the animal is in some kind of paralysis or extreme confinement situation. Sounds like he’s not being taken out enough to go wee. I’m so sorry that Oakley is going through this ruff time. And I agree that if you’re not comfortable, your primary vet can be very helpful in advocating for you and Oakley. Please keep us posted OK? Okay, just want to piggy back on some of what Jerry said, as well as share an experience or two (from myself and others). Once the trust is gone and the communication has broken down, IT IS TIME TO MOVE ON if at all possible!!! And a clinic can be THE best in the world and do everything perfectly almost all the time! But if you’re on the receiving end of the few times things aren’t done as well as they could be, none of the great experiences others had mean squat to you! I took my Happy Hannah to a “specialty clinic” and did NOT have a great experience at all!! Communication and bedside manner were minus zero!! And ues, skill doesn’t always come with good bedside manner! But when you weren’t told SQUAT about recovery, or seromas, and on and on, that doesn’t speak highly of that clinic! Not even going into being told on a week end VM that Happy Hannah had “debris; in her lungs from an xray! Of course, couldn’t speak to anyone til Monday. As it turns out, the message should have been she had “debris in her tummy” fom chewing on a bone I gave her! ANYWAY, another member here when to the same clinic and had a GREAT expereince!!! We see that scenario here on occasion repeated. In my unprofessional opinion and based on what you’ve said, you are experiencing things that should not be happening!!!!! And I don’t mean to scare you at all, but that leg situation really disturbs me!! I certainly think it’s treatable, don’t get me wrong, but it certainly delays recovery and complicates things that are already complicated enough!!! To me, it appears this was preventable if they are saying it was wee related! Sooooo here’s where I’m gping with this in the “for whatever it’s worth pile”! I would pick her up today as long as there isn’t any compelling reason not to. Have her released to your regular Vet. Take her to your regular Vet (or a second opinion Vet). Have her checked out. Have that leg checked out. Have a scraping done to make sure there isn’t any underlying infection going on that needs attention. Then, with your Vet overseeing her and if he agrees its okay, either take her home or to another clinic!! I think you can already teel, we are all cheering for Oakley ! !